Minor league baseball games are awesome. The tickets are cheaper, the people-watching is spectacular and the medium-sized towns are easy to navigate. But if you are like us -- and why wouldn't you be -- you are constantly bombarded with these nagging thoughts that the experience could be so much better if only there was a way to keep having fun IN THE BATHROOM. The p-controlled video game systems will be featured within all men's restrooms at Coca-Cola Park and are exclusively presented by Lehigh Valley Health Network. "These games are sure to make a huge splash," exclaimed IronPigs General Manager Kurt Landes. "Our fans are always looking for the next big thing and these 'X-Stream games' are another example of our commitment to providing an unparalleled entertainment experience." ... 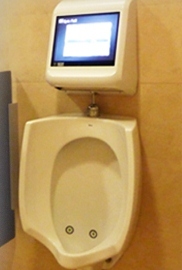 When a user approaches the urinal, the video console flips into gaming mode, using patented technology that detects both his presence and stream. Algorithms then allow the user to engage with the screen by aiming in different directions to test their agility and knowledge. ... Upon completion (an average of over 55 seconds according to published research), users will receive their score and a code to enter. They can then view their position on the leader board or check the website to see how they stack up with the rest of that night's competition! High scores will be displayed in real-time across various videoboard displays within Coca-Cola Park. Best thing ever or greatest thing ever?